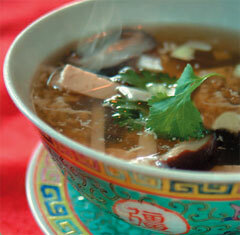 This classic Thai soup will warm you to your bones in cold weather, and will also stimulate appetite like nothing else. Vegetarian tom yam paste is available from oriental stores and, in UK, specialist delis such as the Selfridges food hall. Or you can make your own by roasting red and green chillies together with garlic and shallots, and grinding the mixture with lime juice, soy sauce, salt and sugar. Serves 2. 1. Bring the stock to boil in a saucepan, and add the tom yam paste. 2. Add all the remaining ingredients one by one and simmer, uncovered, until the mushrooms have cooked but are still a little crunchy. 3. Pour into soup bowls and garnish with coriander and basil leaves before serving.